Introduction: The aim of this study was to evaluate the influence of metal oxides from investment dies on the color of metal-free VM7 ceramic. Materials and Methods: Forty circular patterns were made with an elastic gelatin duplicator. These were divided into four groups (n = 10) for pouring the investment: G1, Begoform (Bego); G2, Ducera Lay Superfit (DeguDent GmbH); G3, Duravest (Polidental), and G4, Refrax Magnum (CNG). Refractory dies were subjected to the degassing process for gas and metal oxide elimination, and the testing was done with the application of two layers of VM7 ceramic. These layers were sinterized in accordance with the manufacturer's recommendation and then glazed. For the control group, 10 additional VM7 ceramic discs were made without the use of any investment die. The ceramic's control color and the tested groups were analyzed with the aid of a portable colorimeter (Minolta CR-10) in the CIELab. The color change (ΔE) of the specimens from the tested groups was obtained, and the data were submitted to one-way ANOVA and post-hoc Tukey's test. Results: All tested groups had a color change from the control group. G1 (5,3) and G2 (5,3) were those that showed the greater color change and did not show statistical differences between themselves; G3 (3,3) and G4 (3,1) were those that showed the least color change from control group and did not show statistical differences between themselves. Conclusion: Once all investments present a perceptible color change from the control group, color selection should be done with a laboratory-produced color scale. Background: Dental radiography is an important tool for detection of caries and digital radiography is the latest advancement in this regard. Spatial resolution is a characteristic of digital receptors used for describing the quality of images. Aim: This study was aimed to compare the diagnostic accuracy of two digital radiographic systems with three different resolutions for detection of noncavitated proximal caries. Settings and Design: Diagnostic accuracy. 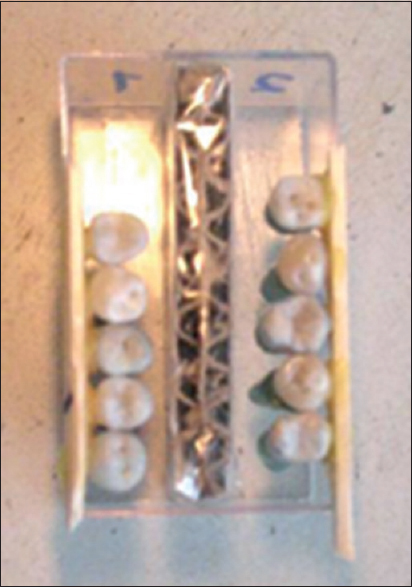 Materials and Methods: Seventy premolar teeth were mounted in 14 gypsum blocks. Digora; Optime and RVG Access were used for obtaining digital radiographs. Six observers evaluated the proximal surfaces in radiographs for each resolution in order to determine the depth of caries based on a 4-point scale. The teeth were then histologically sectioned, and the results of histologic analysis were considered as the gold standard. Data were entered using SPSS version 18 software and the Kruskal-Wallis test was used for data analysis. P <0.05 was considered as statistically significant. Results: No significant difference was found between different resolutions for detection of proximal caries (P > 0.05). RVG access system had the highest specificity (87.7%) and Digora; Optime at high resolution had the lowest specificity (84.2%). Furthermore, Digora; Optime had higher sensitivity for detection of caries exceeding outer half of enamel. Judgment of oral radiologists for detection of the depth of caries had higher reliability than that of restorative dentistry specialists. Conclusion: The three resolutions of Digora; Optime and RVG access had similar accuracy in detection of noncavitated proximal caries. Context: Periodontitis is a chronic inflammatory disease caused by bacterial infection of the supporting tissues around the teeth. Serum albumin levels might be the practical marker of general health status. Albumin concentration is associated with nutrition and inflammation. Aims: The aim of this study was to evaluate the relationship between periodontal health status and serum albumin levels. Subjects and Methods: A total of 60 subjects of both genders with age range of 40-70 years were included in the study. Patients were divided into two groups viz. Group I; clinically healthy subjects and Group II; patients with chronic periodontitis, that is, loss of attachment ≥5 mm. Serum albumin concentration was estimated by bromocresol green albumin method. Statistical Analysis Used: Student's unpaired t-test. Results: The mean value of serum albumin levels for Group I was 4.815 g/dL with standard deviation (SD) of 0.127 and for Group II, the mean value of serum albumin levels was 4.219 g/dL (SD 0.174). The difference between serum albumin levels in Group I and Group II were found to be statistically significant ( P ≤ 0.001). Conclusions: The findings of this clinical trial suggest an inverse relationship between the serum albumin concentration and chronic periodontal disease. Context: Discrepancies at the abutment/crown interface can affect the longevity of zirconia restorations. Aim: The aim was to evaluate the marginal and internal discrepancies (MD and ID) of zirconia copings manufactured by two milling systems with different finish lines. Materials and Methods : Three aluminum-master-dies (h = 5.5 mm; Ψ =7.5 mm; 6΀), with different finish lines (large chamfer [LC]; tilted chamfer [TC]; rounded shoulder [RS]) were fabricated. Twenty impressions were made from each master die and poured. Sixty zirconia copings were manufactured and divided according to the factors "finish line" and "milling system" (n = 10): CAD LC = Computer-aided design/computer-aided manufacturing (CAD/CAM) + LC; CAD TC = CAD/CAM + TC; CAD RS = CAD/CAM + RS; MAD LC = manually aided design/manually aided manufacturing (MAD/MAM) + LC; MAD TC = MAD/MAM + TC; and MAD RS = MAD/MAM + RS. For MD analysis, each coping was fixed, and the distance between the external edges of the coping and the edge of the cervical preparation was measured (50 points). Using the same copings, the ID of each coping was evaluated, by the replica technique, at 12 points equally distributed among the regions (n = 10): Ray (R), axial (A), and occlusal (Occl). The measurements were performed by optical microscopy (Χ250). The data (μm) were subjected to parametric and non-parametric statistical analyses. Results: For the MAD/MAM system, the "finish line" (P = 0.0001) affected significantly the MD median values (μm): LC = 251.80 a , RS = 68.40 a and TC = 8.10 b (Dunn's test). For the CAD/CAM system, the median MD values (μm) were not affected by the factor "finish line" (P = 0.4037): LC = 0.82 a , RS = 0.52 a , and TC = 0.89 a . For the ID, it was observed interaction between the finish line types and the region (P = 0.0001) and between region and milling system (P = 0.0031) (RM-ANOVA). Conclusions: The CAD/CAM system presented lower MD values, regardless the finish line. However, the MAD/MAM system showed ID values smaller than those of CAD/CAM. Background: Preterm low birth weight (PTLBW) is a public health issue which needs to be dealt with by educating the general female population. One of the major contributing factors is periodontal disease and treatment of the same could reduce the occurrence of PTLBW babies. Therefore, awareness of this among the female population is highly essential. Hence, this survey was planned with the aim to explore the awareness of the general female population regarding the association of periodontal disease and PTLBW. Material and Methods: This survey consisted of nine close-ended questions answered by 1284 females. Results: Younger individuals had higher knowledge scores as compared to the older individuals (r = −0.161) and the more educated group had a higher knowledge score as compared to the less educated groups (r = 0.322). Furthermore, married women seemed to be more aware of the relation of PTLBW to periodontal disease as compared to unmarried women. Conclusion: Younger and educated females had better awareness of the association between periodontal diseases and PTLBW. Hence, efforts to educate the general female population on this association could contribute toward the reduction of the risk of PTLBW. Context: Like normal tissues, tumors require an adequate supply of oxygen, metabolites and an effective way to remove waste products. This is achieved by angiogenesis, which is defined as the process by which new blood vessels are produced by sprouting from preexisting vasculature. There is a large spectrum of physiological and pathological processes in which angiogenesis occur, ranging from tissue hypertrophy, wound healing, and inflammation to tumors. 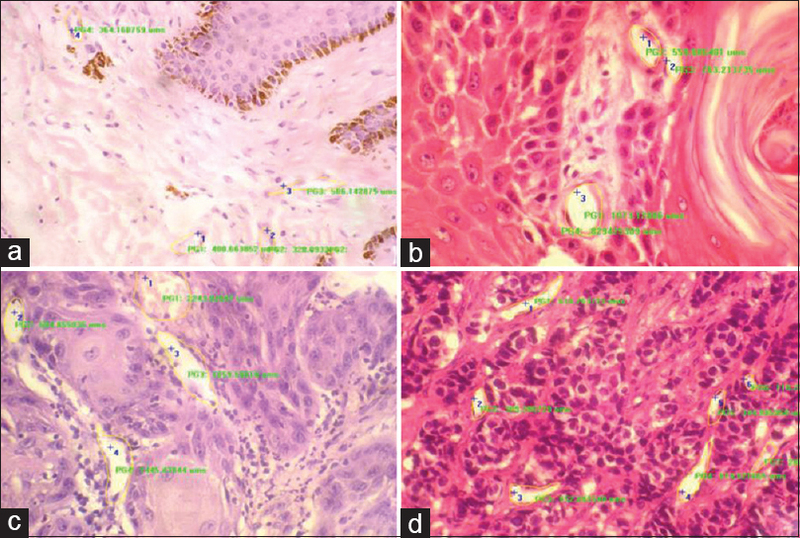 Aims: The present study was designed to morphometrically evaluate the angiogenesis in different grades of oral squamous cell carcinomas (OSCCs) under light microscope by the use of H and E stained sections and to assess that whether the parameters of vascularity like mean vascular density (MVD), mean vascular area (MVA), and total vascular area (TVA) can be used to histologically grade the tumors. Subjects and Methods: A total of 10 cases each of well-, moderately- and poorly-differentiated SCC cases were retrieved from the archives of the Department of Oral Pathology and Microbiology and were morphometrically analyzed for mean vascular density (MVD), MVA, and TVA. Ten cases of normal oral mucosa were taken as Control. Statistical analysis was done using SPSS 19.0 version (IBM, Armonk, NY, USA) software for windows. Group mean for MVD, TVA and MVA were calculated for 10 cases of each group. "Student's t-test" was applied to assess the intergroup variation of mean values of MVD, TVA, and MVA. Results: Our results showed significant differences between all the three parameters, that is, MVD, MVA and TVA when poorly differentiated OSCC was compared with the normal mucosa, well- and moderately-differentiated OSCC. However, when comparison was made between the well- and moderately-differentiated OSCC, the differences in the three parameters were present but not statistically significant. Conclusion: There was an increased MVD, MVA and TVA in poorly differentiated OSCC, which could be used as an additional criterion to histologically grade the tumor. Aim: The aims of this in vitro study were to see potential applications of multidetector computed tomography (MDCT) in the analysis of root canal morphology. 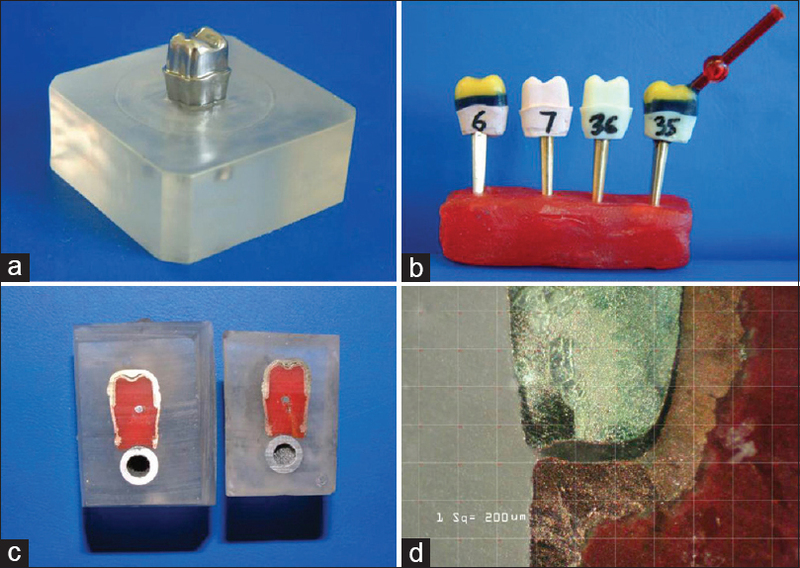 Materials and Methods: In this in vitro study measurement of root and canal diameters, root and canal diameter ratios, and radicular wall thickness at different levels in maxillary canines with long oval root canals. A total of 40 human maxillary canines, with single long oval canals were selected for this study. 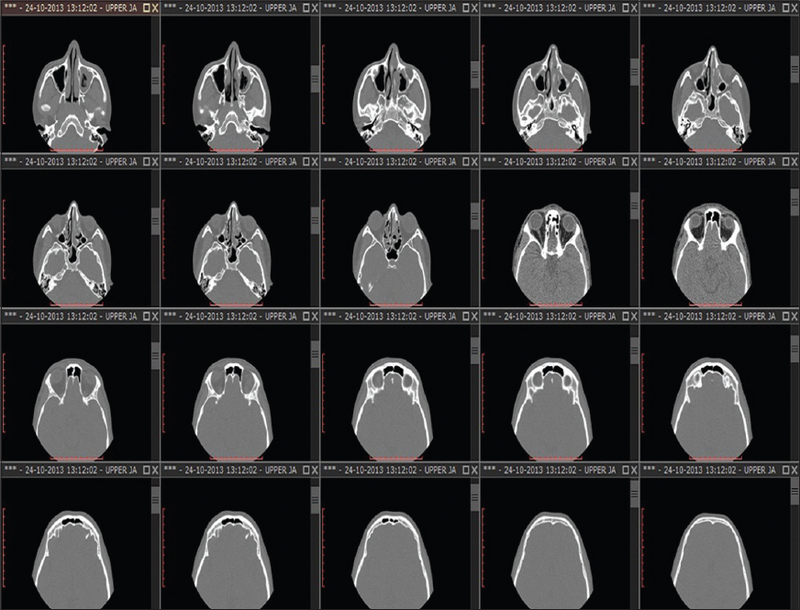 The specimens were analyzed with MDCT (16 slice) through dentascan software. The cross-sections corresponding to 625 mm slice thickness from the radiologic apex were analyzed to measure the mesiodistal (MD) and buccolingual (BL) diameters of the canals and the thickness of the root and the walls. The BL/MD ratios of the canal (∆C) and the root (∆R) diameters were calculated, as was as the mean taper in both a BL and an MD dimension. 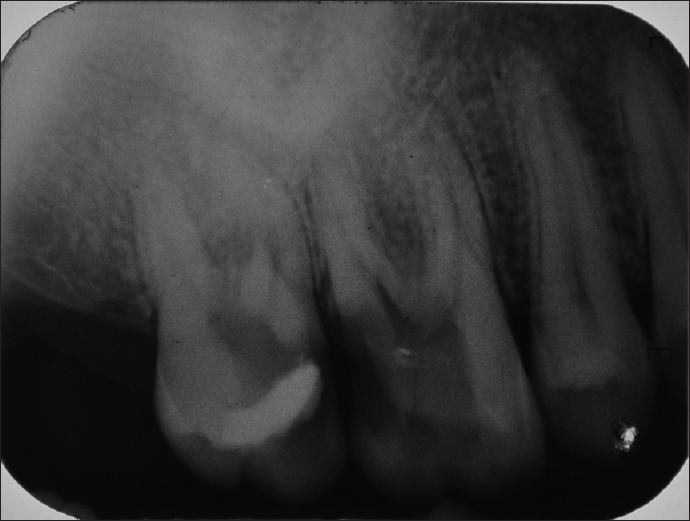 Results: A high correlation was established between the shape of the root canal and the corresponding root. Conclusion: Clinical Implications of these techniques is useful to clinician and it can also be applied to improve preclinical training and analysis of fundamental procedures in endodontic and restorative treatment. Context: C-reactive protein (CRP) estimation for quantitative analysis to assess anti-inflammatory action of nonsteroidal anti-inflammatory drugs (NSAIDs) after surgery in maxillofacial surgery. Aims: This study was to evaluate the efficacy of CRP as a quantitative analysis for objective assessment of efficacy of three NSAIDs in postoperative inflammation and pain control. Settings and Design: The parallel study group design of randomization was done. Totally 60 patients were divided into three groups. CRP was evaluated at baseline and postoperatively (immediate and 72 h) after surgical removal of impacted lower third molar. The respective group received the drugs by random coding postoperatively. Subjects and Methods: The assessment of pain control and inflammation using NSAIDs postoperatively after surgical removal of impacted lower third molar was qualitatively and quantitatively assessed with CRP levels. 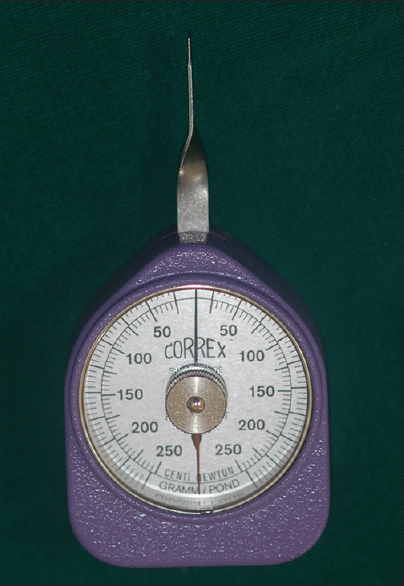 The blood sample of the patient was assessed immediate postoperatively and after 72 h. The visual analog scale (VAS) was used for assessment of pain and its correlation with CRP levels. Statistical Analysis: Comparison of difference in levels of CRP levels had P < 0.05 with immediate postoperative and baseline levels. The duration of surgery with association of CRP levels P = 0.425 which was nonsignificant. The pain score was increased with mefenamic acid (P = 0.003), which was significant on VAS. Results: Diclofenac had the best anti-inflammatory action. There was a significant increase in CRP levels in immediate postoperative values and 72 h. CRP test proved to be a useful indicator as a quantitative assessment tool for monitoring postsurgical inflammation and therapeutic effects of various anti-inflammatory drugs. Conclusions: CRP test is a useful indicator for quantitative assessment for comparative evaluation of NSAIDs. Objective: The aim was to find the prevalence of dental caries, periodontitis, and oral hygiene index-simplified (OHI-S) among 12-year schoolchildren having normal occlusion and malocclusion in Mathura city. Materials and Methods: The present study was a cross-sectional study done among the 100 subjects who have been selected from 5 schools in four different geographical locations. The data regarding their socio-demographic characteristics, dental caries status, periodontitis status and oral hygiene status was collected using structured proforma. Means, standard deviations and test of significant were used as statistics to describe the data. 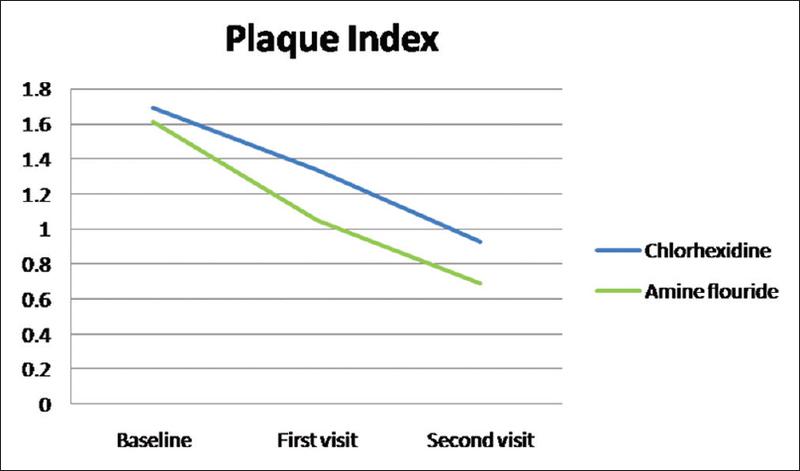 Results: The results showed that there was no significant difference between dental caries status, periodontitis status among subjects having normal occlusion and malocclusion (P = 0.06, 0.093) but significant relationship was found OHI-S and children who were having malocclusion (and P = 0.022). Significant difference was also found between periodontitis and oral hygiene status (P = 0.00). 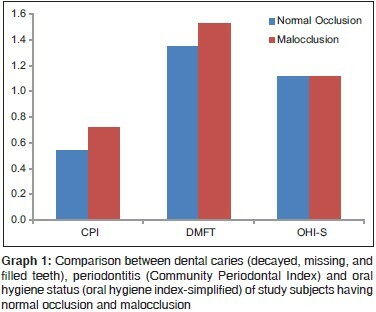 Conclusion: It was observed from the present study that normal occlusion and malocclusion had no or weak significant effect on overall caries and periodontitis prevalence whereas oral hygiene status had a strong effect on overall periodontitis prevalence but not in relation to prevalence of dental caries in 12-year-old school children in Mathura city. Background of the Study: The aim of this study is to evaluate the efficacy of natural curcumin in the management of chronic periodontitis as local drug delivery in comparison to synthetic chlorhexidine, which is the gold standard. 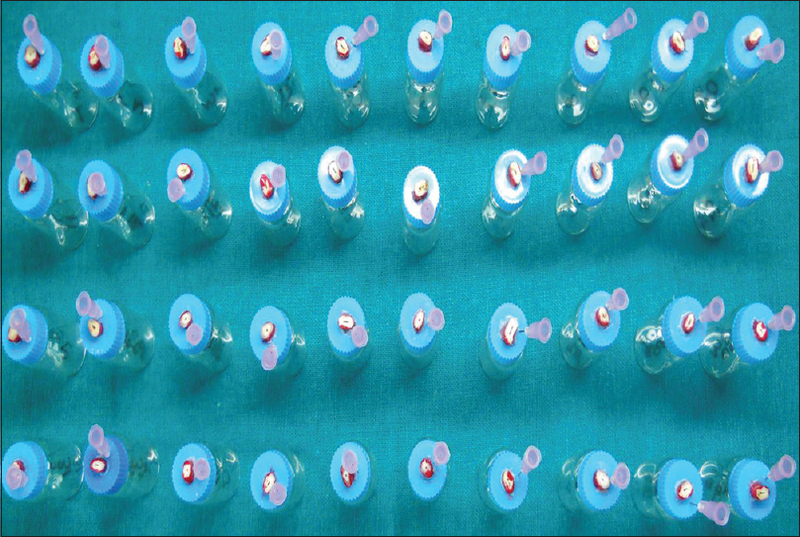 Materials and Methods: Thirty chronic periodontitis patients with an age range of 20-50 years with probing pocket depth (PPD) of 4-6 mm were included. Curcumin and chlorhexidine gel was applied in the contralateral disease sites at baseline and day 15. The clinical parameters like PPD, clinical attachment level (CAL), gingival index (Loe and Silness) and plaque index (Turesky Gillmore modification of Quigley Hein) were recorded and colony forming units (CFU) were assessed microbiologically at baseline, 15 and 30 days. Results: There was a significant reduction of the clinical parameters (PPD, CAL) and microbiological parameters CFU at 15 and 30 days for both the groups. Curcumin group showed a greater reduction in the clinical parameters when compared with chlorhexidine group. Both groups had a significant reduction in parameters when compared with baseline. Conclusion: Although curcumin has equivalent benefit to chlorhexidine, curcumin being an ayurvedic herb is an excellent alternative to chlorhexidine due to minimal side-effects. Objectives: The objective of this triple blind randomized controlled clinical trial was to compare the efficacy of a mouth rinse containing amine fluoride (AmF) and chlorhexidine in controlling the supragingival plaque accumulation and gingival inflammation during a 4-week period in patients with chronic gingivitis. Subjects and Methods: A total of 30 patients were participated in this study. Fifteen patients were prescribed an AmF-containing mouth rinse and 15 were prescribed a chlorhexidine mouth rinse. Plaque index, gingival index, bleeding index, tooth stain, and tongue stain (TS) were recorded at baseline, 15 days and 1-month. Patients' perception of odor, taste and any discomfort were recorded. Results: The comparisons between the groups were done using Mann-Whitney U-test. The comparison within the group at different time visits were done using Wilcoxon signed rank test. Both the mouth rinses resulted in a significant decrease in plaque index, gingival index, bleeding index. However, AmF mouth rinse resulted in a statistically significant decrease in bleeding index and gingival index compared to chlorhexidine group. There was no significant difference in tooth stain and TS in both the groups. Conclusions: The 4 weeks use of AmF containing mouth rinse is effective in reducing the gingival inflammation and plaque. Context: Imaging techniques and endodontics are inseparable from each other as the former have always been the cornerstone for successful endodontic diagnosis and treatment. 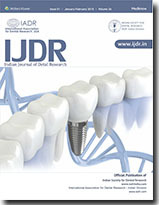 Aims: The objective of this study was to detect the presence of extra canals in the mesiobuccal root of the maxillary first molar using cone-beam computed tomography (CBCT). Materials and Methods: In this study, 75 freshly extracted human maxillary first molars were mounted on arches and exposed to CBCT and digital radiography (control). The incidence of additional canals is then evaluated using CBCT and the teeth identified with additional canals were marked and again exposed to RVG. Statistical Analysis Used: The results were analyzed by three examiners two endodontists and an oral radiologist to eliminate bias. Inter and intra rater agreement was analyzed using the kappa coefficient. Results: Statistical analysis revealed the incidence of extra canals to be at 47.1% with the difference between the readings of the 3 examiners being statistically insignificant. Conclusions: CBCT can be considered an advanced diagnostic tool for primary and secondary endodontic treatments. 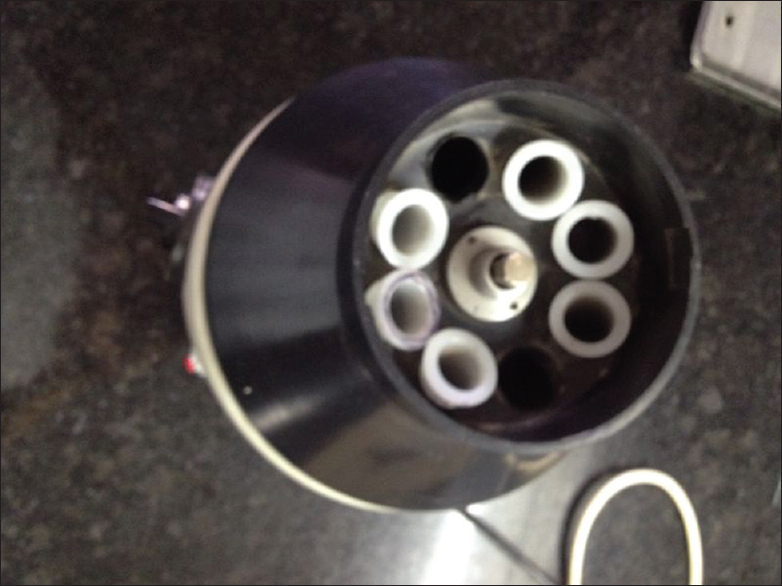 Aims: To compare the apical extrusion of Enterococcus faecalis after instrumentation with three different Ni-Ti rotary instruments- An in vitro study. 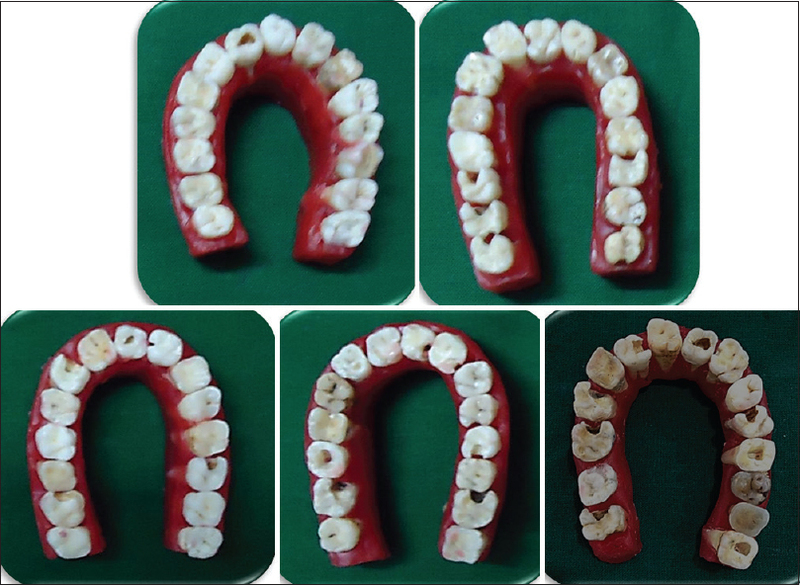 Settings and Design: In vitro study Methods and Material: Forty freshly extracted mandibular premolars were mounted in bacteria collection apparatus and root canals were contaminated with a suspension of Enterococcus faecalis. The contaminated teeth were divided into 4 groups of 10 teeth each according to rotary system used for instrumentation: Group1: Hyflex files, Group 2: GTX files, Group 3: Protaper files and Group 4: control group (no instrumentation). Bacteria extruded after preparations were collected into vials and microbiological samples were incubated in BHI broth for 24 hrs. The colony forming units were determined for each sample. Statistical Analysis Used: Statistical analysis was done using one way ANOVA followed by post hoc independent " t" test. Results: GTX files extruded least amount of bacteria followed by Hyflex files. Maximum extrusion of E. faecalis was seen in rotary Protaper group. Conclusion: Least amount of extrusion was seen with GTX files followed by Hyflex files and then rotary Protaper system. Context: Polyurethane resin is a possible alternative to type IV dental stone for fabrication of indirect restorations however its dimensional accuracy is questionable. Aim: The aim was to investigate the dimensional accuracy of silica filled polyurethane resin die material by evaluating the marginal fit and adaptation of indirect gold castings. 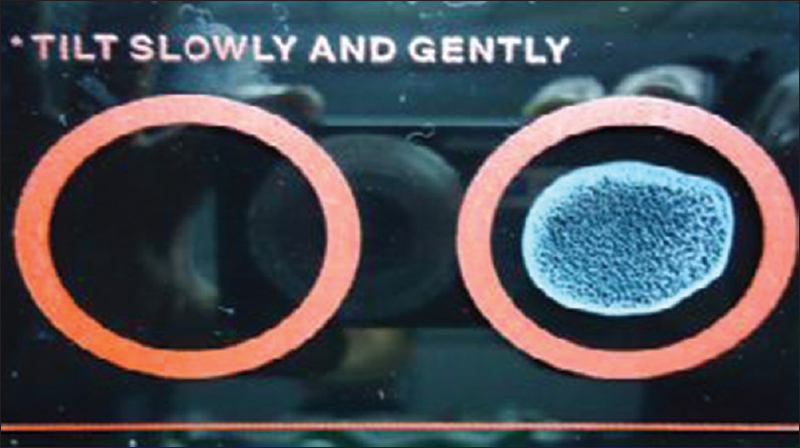 Settings and Design: Experimental, in vitro study. Materials and Methods: Totally 40 copper plated replicas of a nickel chrome master die analogous to a veneer gold crown preparation were made and impressions recorded using polyvinylsiloxane material. Twenty impressions were poured in type IV dental stone (control group (Vel-mix, Kerr, UK) and the remaining (n = 20) in silica filled polyurethane die material (test group) (Alpha Die MF, CA, USA). Gold castings were fabricated for each die using standardized techniques. The castings were seated on their respective copper plated dies, embedded in resin and sectioned. The specimens were analyzed by measuring marginal opening and the area beneath the casting at a ×63 magnification and using image analysis software. Statistical Analysis Used: Data were analyzed using a Student's t-test. Results: No significant difference was observed between the experimental groups (P > 0.05). The mean marginal opening for type IV, dental stone and polyurethane resin, was 57 ± 22.6 μm and 63.47 ± 27.1 μm, respectively. Stone displayed a smaller area beneath the casting (31581 ± 16297 μm 2 ) as compared to polyurethane resin (35003 ± 23039 μm 2 ). Conclusions: The fit and adaptation of indirect gold castings made on polyurethane and type IV dental stone dies were comparable. Aim: The aim of this in vitro study was to observe and compare the microstructure of the adhesive interface between resin and dentin treated with Papacarie® using scanning electron microscopy (SEM). Materials and Methods: Totally, 10 human dentin slabs were randomly distributed into two groups. The control group (n = 5) was subjected to etching with 37% phosphoric acid for 20 s and washed for 30 s, dried with absorbent paper, and the bonding agent was applied along with low viscosity resin. In turn, the experimental group (n = 5) was subjected to the same procedure, but Papacarie® (Fσrmula and Aηγo, Sγo Paulo, Brazil) was added for 30 s prior to etching. Adper™ Single Bond 2 (3M ESPE, Sγo Paulo, Brazil) adhesive was applied to both groups following manufacturer instructions. The specimens were prepared for observation under SEM with ×1.000, ×2.000, ×2.200 and ×5.000 magnification. The micrographs were evaluated with respect to the formation of the hybrid layer, thickness, shape and length of the tags and microtags. Results: In the experimental group there was the formation of more fine hybrid layer and tags with average of similar length to the control group; microtags in less number and without formation of lateral branches. The resin tags presented conical, smooth and uniform characteristics. Conclusions: When Papacarie® was used prior to the application of a bonding agent it could interfere with the formation of the hybrid layer without changing the length of the tag. Moreover, the morphology in the experimental group was found to be more uniform and regular. Nonsurgical endodontic therapy of a right maxillary first molar with three roots and seven root canals. This unusual morphology was diagnosed using a dental operating microscope (DOM) and confirmed with the help of cone-beam computed tomography (CBCT) images. CBCT axial images showed that both the palatal and distobuccal root have a Vertucci type II canal pattern, whereas the mesiobuccal root showed a Sert and Bayirli type XVIII canal configuration. The use of a DOM and CBCT imaging in endodontically challenging cases can facilitate a better understanding of the complex root canal anatomy, which ultimately enables the clinician to explore the root canal system and clean, shape, and obturate it more efficiently. Obstructive sleep apnea (OSA) is one of the most common forms of sleep-disordered breathing. Various treatment modalities include behavior modification therapy, nasal continuous positive airway pressure (CPAP), oral appliance therapy, and various surgical modalities. Oral appliances are noninvasive and recommended treatment modality for snoring, mild to moderate OSA cases and severe OSA cases when patient is not compliant to CPAP therapy and unwilling for surgery. 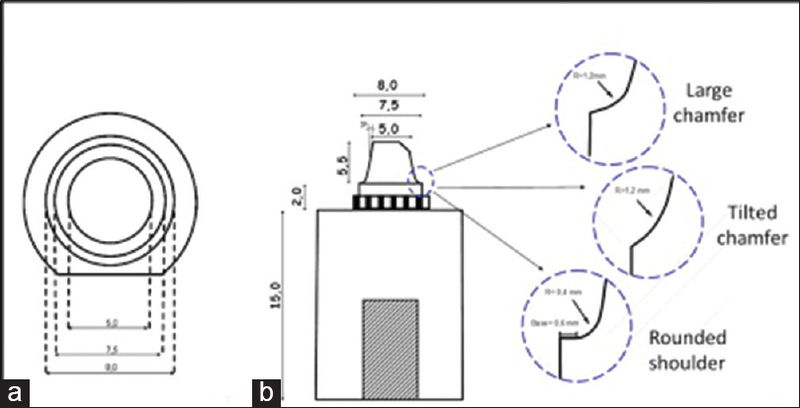 Acoustic reflection technique (ART) is a relatively new modality for three-dimensional assessment of airway caliber in various clinical situations. The accuracy and reproducibility of acoustic rhinometry and acoustic pharyngometry assessment are comparable to computerized tomography and magnetic resonance imaging. 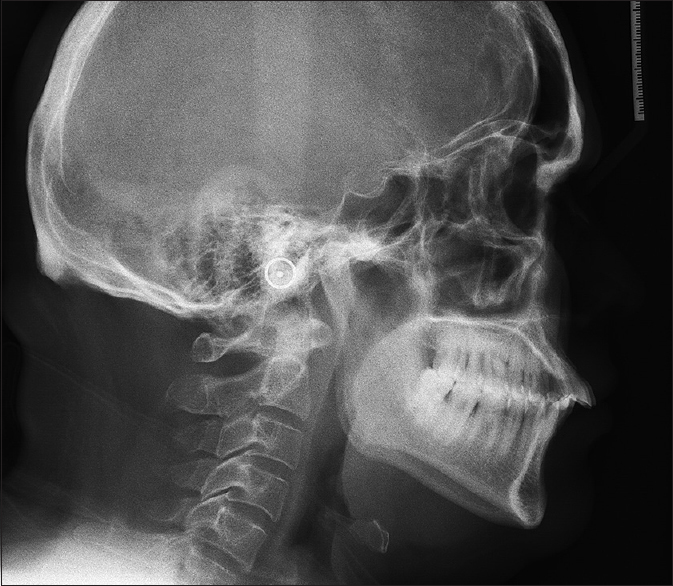 This case report highlights the therapeutic efficacy of an innovative customized acrylic hybrid mandibular advancement device in the management of polysomnography diagnosed OSA cases, and the treatment results were assessed by ART. Regenerative endodontic procedures are biologically based procedures which deal with the regeneration of pulp-like tissue, more idealistically the pulp-dentin complex. The regeneration of this pulp-dentin complex in an infected necrotic tooth with an open apex is possible only when the canal is effectively disinfected. Though there are various procedures for treating open apex ranging from Ca(OH) 2 apexification, mineral trioxide aggregate apexification and surgical approach, regeneration of tissues has always taken superior hand over the repair of tissues. The mechanics behind the regenerative endodontic procedures is that despite the tooth being necrotic, some pulp tissue can survive apically which under favorable conditions proliferate to aid in the process of regeneration. In the past 2 decades, an increased understanding of the physiological roles of platelets in wound healing and after tissue injury has led to the idea of using platelets as therapeutic tools in the field regenerative endodontics. 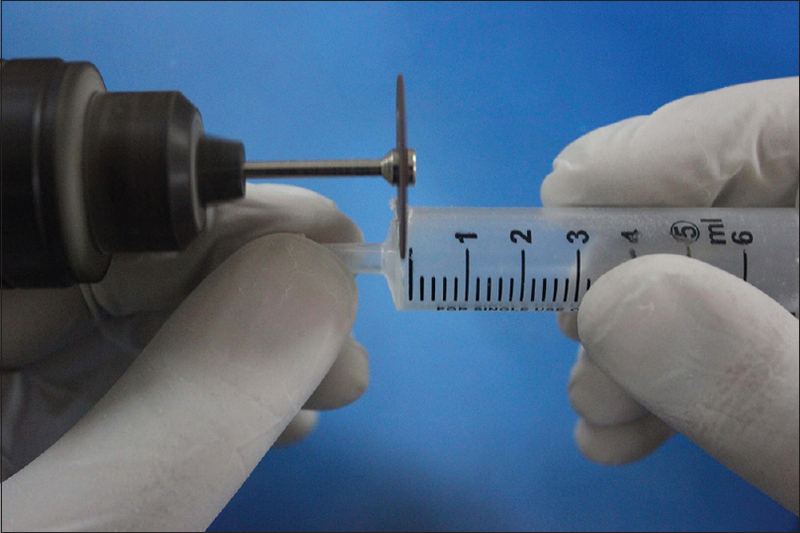 In the present case report with an open apex, high sterilization protocol is followed using triple antibiotic paste as intra-canal medicament, followed which platelet rich fibrin is used as the regenerative material of choice. Over an 18-month follow-up period, clinically patient is asymptomatic and radiographically there is complete regression of the periapical lesion and initiation of the root end closure. Intramuscular vascular anomalies are rare congenital hamartomatous lesions. Less than 1% of these occur in skeletal muscle out of which 15% arise in head and neck musculature. In the head and neck region, masseter muscle is the most common site. It accounts for about 5% of intramuscular vascular malformations. They are present from birth but are clinically apparent during infancy and childhood and occasionally during adulthood. 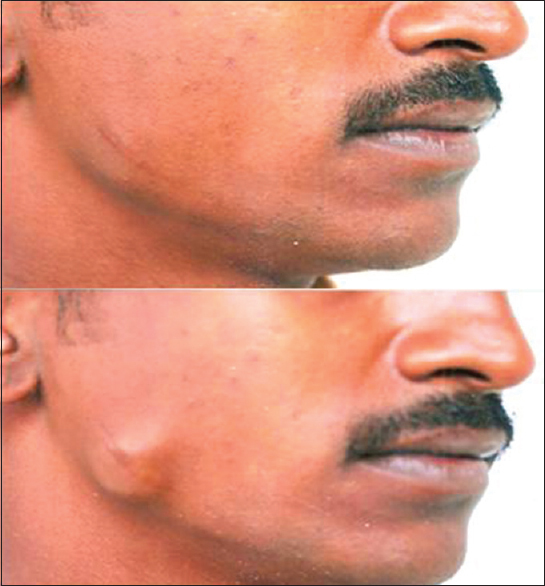 Due to its location it is often mistaken for a parotid swelling. The usual treatment of choice is surgical excision with a margin. This is associated with loss of motor function, hemorrhage, nerve damage. Intralesional sclerotherapy, embolization are nonsurgical alternatives for treatment of slow flow venous malformations. Sclerotherapy can be used solely in multiple sittings or as an adjunct to surgery. This article presents a case report of a 28-year-old male with recurrent intramuscular vascular malformation in the masseter muscle, which was successfully treated by ethanol sclerotherapy. Intravascular papillary endothelial hyperplasia (IPEH) is an unusual reactive lesion of vascular origin, which rarely occurs in the oral cavity. Pathogenetically, is it divided into true, mixed and extra-vascular types. 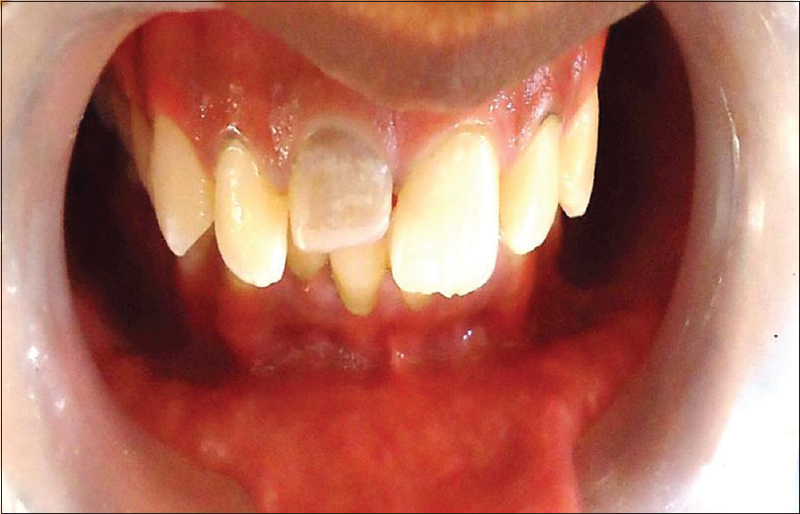 We report a case of extra-vascular IPEH of the lower lip in 54-year-old female patient. Patient gives history of trauma 4 months back with lesion developing at the site to trauma. The lesion was 3 cm × 4 cm in size with soft to firm in consistency. Histologically, it is characterized by an exuberant papillary endothelial cell proliferation toward the lumen of an enlarged blood vessel from the area of an organizing thrombus. The lesion was surgically excised under local anesthesia. The patient was followed for 1-year with no evidence of recurrence. This paper discusses the various aspects of IPEH of the oral cavity such as pathogenesis, clinical features, histopathology treatment, and prognosis. A technique of fabricating feldspathic porcelain pressable ingots was proposed. A 5 ml disposable syringe was used to condense the powder slurry. The condensed porcelain was sintered at 900΀C to produce porcelain ingots. The fabricated porcelain ingots were used in pressable ceramic machines. The technological advantages of pressable system improve the properties, and the fabricated ingot enhances the application of feldspathic porcelain.